Two suspects have been arrested for the fatal shooting of man in Antioch in February, police said. Felton Clifton, 29, of Concord is believed to have shot 32-year-old Alvin Crane in the 900 block of W. Third St. Feb. 21. Clifton was arrested May 31 in Concord on suspicion of murder. Kelly Corbitt, 42, has also been arrested on suspicion of murder, police said. Corbitt was arrested Wednesday in Emeryville. 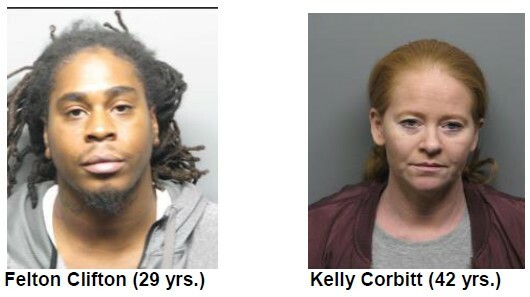 Police said Contra Costa County prosecutors have filed murder charges against both suspects. A woman was shot at the same location as Crane and survived. Fine upstanding citizens from our community. Great role models!! Looks like the same Alvin Crane involved in a shooting, selling of cocaine, possession of fire arms in 2015. Guess he served time and went right back to the same lifestyle. Probably needed a therapy dog and a quiet room. A lot of kids are picked on by jock guys and turn out fine later in life. Also, some jock guys turn out later in life to be complete tools. Perhaps behavior is predicated upon one’s own moral compass. Those folks will not see the light of day for awhile! Quite serious charges! They need to pay for their crimes! Maybe they should have a trial first? We have so many issues with violence, homeless everywhere and it’s only going to get worse unless everyone wake up and vote Republican. We must stand for up and demand change if we want to protect our way of life.